This is a very easy to make craft. Hollowed-out eggshells make naturally beautiful vases for tiny flower arrangements. Save that egg shell from breakfast and make a sweet little posy vase for tiny flowers. This looks lovely on the breakfast table, on a breakfast tray or in any corner that needs a little splash of bright color. You will need an egg, some fabric colors, beads/mirror pieces( small)/eyelets/brads, craft wire, and some glue, plasticine clay, candies or jellybeans (mm sounds deliciously interesting! ), tissue paper in color of your choice. 1. 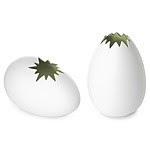 To make them, carefully break open egg near the top (it will be the mouth o the vase) so that a small hole appears. Empty the content of egg in a bowl. Lay it aside. You will need it to make French omelet after you finish with your project. 2. Roll the plasticine clay and glue it around the bottom of your vase. This will give stability to the vase and it won't wobble. Alternatively you can put a small screw in the egg if you don't want to "disfigure" the egg or place it in an eggcup for stability. 3. Now you have to decide how you want to decorate the vase. You can paint some motifs, designs or draw a simple smiling face; it's all up to you. But if you want to put in more labor then you can use beads, mirrors/ eyelets or brads. You may like to use them singly or all of them collectively, it's again up to your imagination. 4. Another way of decorating the eggshell vase is to decoupage it with colored tissue paper. It is a process of gluing pieces of paper, pictures and other thin materials to an object. Through the use of many layers of the glue medium, the finished product appears as though the work has been painted on, instead of simply glued on. 5. Our vase is ready! Now we need something to put in the vase. Fill it with jellybeans or other small candies or use it to display small floral arrangement. 6. If you want to add flowers, then craft paper can be cut into different flower shapes and wire be pierced in it, which will be the stem. 7. Flowers can be made of beads also. 8. 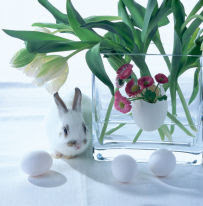 Better still, Cut a few short stemmed flowers and arrange in the eggshell. There is nothing more wonderful than lovely smelling fresh flowers. 9. Put your vase on your T.V. or a bookshelf and enjoy your work while taking a bite of French omelet.